AirShield2how | 802 Secure, Inc. Beyond the Network – AirShield scans beyond the network to uncover risky devices and networks that pose a threat, compliance issue, or breach to company infrastructure, data, or safety across the Cyber Physical environment. Beyond WiFi – 80% of IoT is wireless, therefore gaining visibility into IoT devices requires looking more broadly across the Radio Frequency (RF) spectrum and deeper into the protocols. 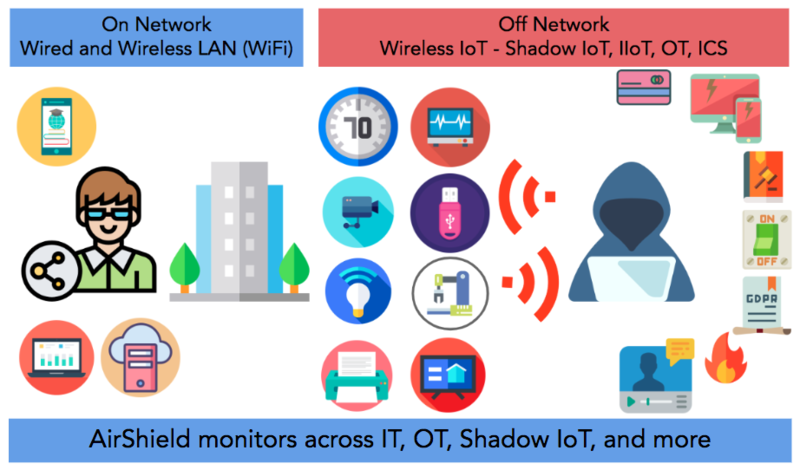 AirShield looks at both the traditional IT WiFi networks for Rogues, but also Bluetooth, Cellular, and more to identify wireless devices and risks across other protocols and frequencies to bring visibility to IoT and IIoT wireless networks across OT and the Physical surroundings. IoT Fidelity – While traditional network monitoring products provide long lists of MAC addresses, Wireless Deep Packet Inspection (WDPI) is necessary to determine the actual IoT device. For example, distinguishing between a Surveillance Camera vs. a Spy Camera greatly impacts the ranking of a risk within an organization. Where others leave off, AirShield’s Wireless Deep Packet Inspection (WDPI) provides clear insights into the device thereby allowing categories of devices and networks sorted by Consumer IoT, IIoT, Automotive, Aircraft, and more. This uncovers “needles in the haystack” to uncover the high risk and unmanaged devices in the organization.